The 9/11 Commission hearings on appear to have raised concerns about both the Bush Administration's credibility and its overall performance, even on the issue on which the Administration may be staking its re-election. Nearly six in ten Americans are following the hearings closely, and the latest CBS News Poll, conducted Tuesday through Thursday, shows declines in the President's approval ratings in a number of policy areas, but especially changes in the evaluation of the President's handling of terrorism. There has been little impact on the campaign, however, in the places it most matters -- the 18 "battleground states." The race in that critical group of states continues to be too close to call. Americans believe the Bush Administration is cooperating with the 9/11 Commission, but that there is still more to learn: most say the Administration isn't telling the entire truth about what they knew before 9/11. Only one-quarter thinks the Bush Administration is telling the entire truth about what they knew of the terror threat prior to 9/11. 59 percent say they are mostly telling the truth but still hiding something about that knowledge, and 11 percent say they are mostly lying. WHAT DID THEY KNOW BEFORE 9/11? : IS THE BUSH ADMINISTRATION…? Views on this are about the same today as they were nearly two years ago, in the spring of 2002, when 73 percent said the Administration was hiding something or lying about what it knew pre-9/11, compared to 70 percent now. Nearly six in ten Americans say they are very or somewhat closely following the work of the commission, and those hearings appear to be affecting way the country views the Administration's performance in the war on terrorism. While a majority continues to believe that the policies of the Bush Administration are making the U.S. safer from terror, this view has dropped nine points from three weeks ago and is now at its lowest level. THE BUSH ADMINISTRATION'S POLICIES HAVE MADE THE U.S….? And while the President's approval rating for handling the war on terror is higher than his ratings on foreign policy, handling Iraq, or the economy, this rating has now slipped to 58 percent -- its lowest level since CBS News began tracking it in November, 2001, dropping six points in three weeks. The President announced that National Security Advisor Condoleezza Rice would appear before the Commission as this poll began. A majority -- 56 percent -- believes the Bush Administration is cooperating with the investigation. Republicans and Independents think so, though Democrats aren't so sure. IS THE WHITE HOUSE COOPERATING WITH 9/11 COMMISSION? The public today has higher expectations for a President's ability to control the terrorist threat than it did two years ago. Today a majority -- 52 percent -- says terrorism is something a President can do a lot about. In May of 2002, 45 percent held this view. IS TERRORISM SOMETHING A PRESIDENT CAN DO A LOT ABOUT? Looking back before September 11th, 2001, about seven in ten Americans believe that the Bush administration and the Clinton administration could have done more to prevent the attacks -- with even more saying the FBI and CIA could have done more to stop the tragedy. COULD HAVE DONE MORE TO PREVENT 9/11? The hearings investigating 9/11 are bi-partisan, but in this election year many are viewing them through a partisan lens: although majorities of Republicans and Democrats think both administrations could have done more, each group makes its harshest judgments about the president who came from the opposite party. Large majorities in both parties say that U.S. intelligence agencies did not do all they could have to stop the attacks. Critics at the hearings, especially former White House counterterrorism advisor Richard Clarke, have suggested that the Bush administration wasn't focused enough on the terror threat prior to 9/11. Seven in ten Americans agree. But just as many say the Clinton administration was not paying enough attention to that threat before they left office. PAYING ENOUGH ATTENTION TO TERROR THREAT BEFORE 9/11? Eight in 10 Republicans say Clinton was not focused, while six in 10 Democrats and nearly seven in ten Independents agree. More than eight in 10 Democrats say Bush was inattentive before 9/11, as do three-quarters of Independents, and more than half of Republicans. 48 percent say the administration has struck the right balance between focusing on Iraq and al Qaeda, while 41 percent say that the Administration is focused too much on Iraq, and not enough on al Qaeda. Much of that response is driven by how Americans view the war with Iraq and its relationship to the war on terror -- a question that divides the country fairly evenly. The half who say Iraq is a part of the war on terror say Bush's balance between Iraq and al Qaeda is about right. Those who see the Iraq war as separate from the war on terror say Iraq has drawn too much of the Administration's focus. Just as approval of the way Bush is handling the war in Iraq is at a low point, so is the public's belief that the war has been worth it. Just 37 percent think the result of the war was worth the loss of life and other costs of attacking Iraq -- the lowest percentage recorded since the question was included in CBS News polls last July. WAS IRAQ WAR WORTH THE COSTS? There is greater public support for military action in Iraq when Saddam Hussein's name is mentioned -- 47 percent think removing Hussein was worth the costs. That figure is also now at its lowest level, matching a poll conducted last December, just before Saddam Hussein was captured. Despite these measures of dissatisfaction with the results, a majority still thinks attacking Iraq was the right thing to do, although the percentage continues to decline. 55 percent say it was the right thing to do, while 39 percent disagree and say the U.S. should have stayed out. The public's hesitancy about supporting the war in Iraq may stem from concerns about how that war has affected the U.S. in terms of terrorist attacks. This poll shows that a shrinking number think the war in Iraq has made the U.S. safer from terrorism, and fewer now than before see Iraq as part of the war on terror. 36 percent now think the war in Iraq has made the U.S. safer from terrorism, something members of the Bush administration have often claimed. That represents a 14-point drop since the beginning of this year. In addition, the number of people who see Iraq as a major part of the war against terrorism has dropped by 19 points since last April, while major combat was underway. Only one in three now see it as a major part of the war on terrorism, and the percentage who think the war in Iraq had nothing to do with the war on terrorism has grown to 44 percent now, up from 30 percent last April. IS WAR IN IRAQ PART OF WAR ON TERROR? 36 percent now think Saddam Hussein was personally involved in the 9/11 attacks against the U.S., but that is the smallest percentage since the question was first asked in CBS News Polls in September 2002. One other element that may factor into Americans' decreasing enthusiasm for the Iraq war is the public's sense that the U.S. may be there for a long time -- for which the administration gets some of the blame. 79 percent say the Bush administration has not clearly explained how long U.S. troops will have to remain in Iraq. Expectations of how long U.S. troops will have to stay there have lengthened in the past few months. 26 percent now think troops will be in Iraq more than five years -- more than twice the percentage who expected that last December. Fewer than one in ten now think U.S. troops will remain in Iraq for less than a year. HOW LONG WILL U.S. TROOPS HAVE TO REMAIN IN IRAQ? In the last few weeks, the President has lost ground in several areas. His overall job approval is just under the 50 percent mark in this poll and stands at 49 percent. It was 51 percent three weeks ago. In all policy specific areas, his ratings have fallen, and are near or at their all-time lows. Bush's approval rating on handling the economy now stands at 37 percent, near his lowest mark in this area since he took office. He received a 36 percent rating in August 2003. 44 percent approve of how the President is handling the situation in Iraq, a new low. He received a 45 percent rating in December 2003, just before the capture of Saddam Hussein. Just 42 percent approve of his handling of foreign policy, also a low. Even his approval rating on handling terrorism, while still quite positive at 58 percent, has dropped six points in three weeks and is at an all-time low. 36 percent think the country is on the right track, while far more -- 57 percent -- think it is headed in the wrong direction. The percent who think it is going in the wrong direction is at its highest since April 2001. The country is divided on how the economy is doing; half think it is good, but about as many think it is bad. These views have changed little in the past few weeks. Registered voters nationwide may have been affected by the last few weeks of the still-young campaign. In this poll, registered voters give Kerry an edge -- with 48 percent saying they would vote for him and 43 percent saying they would vote for Bush. But that figure masks the tightness of the race in the 18 states which are viewed as the real battleground for the election. In those states the election is tighter -- 47 percent in those states say they will vote for Bush, and 45 percent for Kerry, well within the poll's margin of error. Voters in 18 battleground states were combined (Arizona, Arkansas, Delaware, Florida, Iowa, Michigan, Maine, Minnesota, Missouri, New Hampshire, New Mexico, Nevada, Ohio, Oregon, Pennsylvania, Washington, West Virginia and Wisconsin). Partisanship in these states is similar to party identification among registered voters nationally, although fewer in these states identify themselves as independents. In March, voters gave a 3 percentage point edge to Bush; that has evaporated now, but the change has been less dramatic in the battleground states where the bulk of the advertising campaign has occurred. Three weeks ago, Bush led Kerry nationally by three points, 46 percent to 43 percent, and his lead in battleground states was just about the same, 45 percent to 41 percent. Nationally, partisanship is clearly evident, with about 9 in 10 Republican and Democratic voters saying they will support their party's candidate in November. Independents and moderates favor Kerry over Bush. Most voters express firm support for their candidate, leaving the deadlock to be broken by about a quarter of voters. About three in four voters say their mind is made up, while one in four say it is too early to say for sure for whom they will vote. There is little difference between each candidate's supporters: 75 percent of Kerry voters and 74 percent of Bush voters say they will stick with their candidate. One in four Democrats and just over one in three Independents say their mind is not yet made up. The campaign may be taking a toll on candidate images -- both candidates are about as likely to be viewed negatively as positively by registered voters, and while Kerry may appear to be doing marginally better, that's at least in part because Kerry is less well-known to voters; 39 percent don't have an opinion yet of the Democratic nominee. At this point, those voters who do have an opinion of Kerry are slightly more positive than negative in their assessment. Voters' opinion of the President is slightly more negative. A combination of Republican ads and accusations that he "flip-flops" on issues may have caused Kerry to suffer from the perception among voters that he panders -- a weakness that Bush does not share, at least not from voters nationally. By nearly two to one, voters think Kerry says what he thinks people want to hear rather than what he believes. In contrast, voters are more likely to see Bush as saying what he believes instead of what people want to hear. DOES EACH CANDIDATE SAY WHAT HE BELIEVES? However, while Kerry fares just about as badly in the battleground states on this question as he does nationally, the President's image in the battleground states is worse than it is nationally. In the battleground states 47% think Bush says what he believes, and 48% thinks he says what people want to hear. BATTLEGROUND STATES: DOES EACH CANDIDATE SAY WHAT HE BELIEVES? Despite the fallout from the 9/11 Commission hearings and his lowered approval ratings on terrorism, Bush is still viewed favorably in this area; 72 percent think he is likely to protect the country from terrorist attacks. But although more voters think Bush will protect the country from terrorist attacks than think Kerry will, six in ten voters see Kerry as strong in this area. IS HE LIKELY TO PROTECT THE COUNTRY FROM TERRORIST ATTACK? 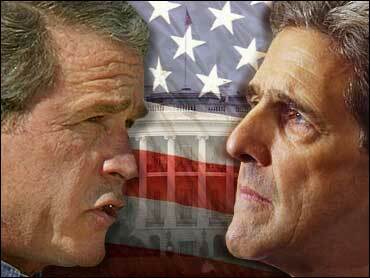 Kerry fares somewhat better than Bush on bringing economic prosperity to the country, however. Voters see the economy as more likely to deteriorate under Bush than under Kerry, and more voters think that under Kerry's stewardship the economy will get better. Views of the campaign are only slightly different depending on where you live. Nationwide, more voters think John Kerry has been running a mostly negative campaign than say that about George W. Bush. By a wide margin, voters think Kerry has spent more time attacking Bush than explaining what he would do as president. But opinion is divided about the incumbent -- with about as many saying he is spending his time attacking John Kerry as saying he is spending his time explaining what he would do if re-elected. And when asked whether either candidate has attacked the other unfairly, more voters single out John Kerry than George Bush. In the 18 battleground states there is less difference in the evaluations of the Bush and Kerry campaigns. 43 percent think Kerry has attacked unfairly, but 39 percent say Bush has done the same. This poll was conducted among a nationwide random sample of 1,024 adults, interviewed by telephone March 30-April 1, 2004. The sample included 834 registered voters. The error due to sampling could be plus or minus three percentage points for results based on the samples of registered voters and all adults. The 18 "battleground states" include Arizona, Arkansas, Delaware, Florida, Iowa, Maine, Michigan, Minnesota, Missouri, New Hampshire, Nevada, New Mexico, Ohio, Oregon, Pennsylvania, Washington, West Virginia, and Wisconsin. For detailed information on how CBS News conducts public opinion surveys, click here.